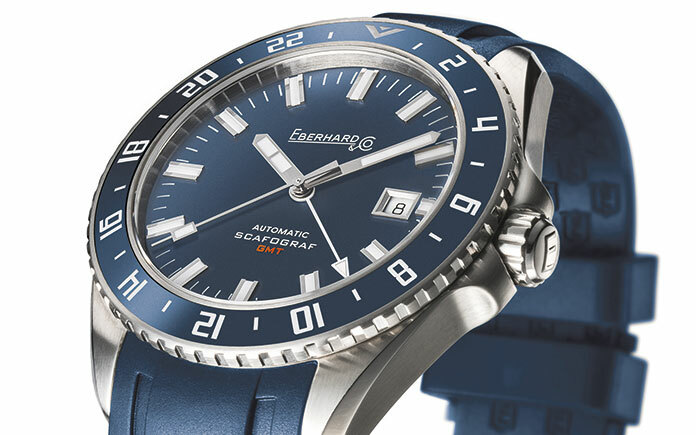 After the success of Scafograf 300, introduced last year and winner of the “Sports Watch Prize” at the prestigious Grand Prix d’Horlogerie de Genève, Eberhard & Co. continues its “journey” through the Scafograf world, this time with a delightful GMT version. The “journey”, for whatever reason it is undertaken, has always been a constant experience in human life, in all eras and in all corners of the world. It’s an opportunity for discovery, exchange, meeting and entertainment, but also an instrument of knowledge and economic development and a promoter of progress. This essential idea has inspired the Swiss watchmaker to create Scafograf GMT, an automatic steel model that maintains the same lines as its predecessor, the Scafograf 300, but has different technical features, starting with the case (43 mm Ø) and triple time zone function that is operated via the position of the bezel and the central GMT hand. The bidirectional rotating bezel is made of steel with a ceramic insert and is available in black or blue depending on the version of the dial, which is proposed in the same colours. The finish is galbé with curved, luminescent applied indices. Water-resistant to 100 m, Scafograf GMT has a screwed case-back, personalised with the engraving of a stylised hemisphere, and comes with a black or blue integrated rubber strap, with a customized “E” shield, the company’s emblem. Small shields also feature on the inside of the strap, providing good breathability. The model is also available with a Chassis steel bracelet completed by a Déclic deployment clasp (Patented).